"Finally, a solution to lugging heavy buckets! The H2GO Bag is perfect for watering horses where no hose is available. 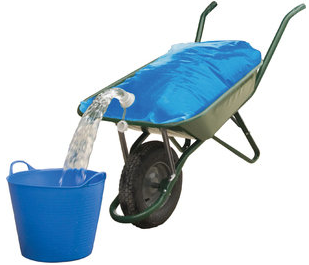 This bag easily transports up to 19 gallons of water and fits neatly into a wheelbarrow so you can fill it and wheel it anywhere. You'll love the convenience of this bag with its easy-pour spout and anti-slide mat." You can buy this wonderful solution here. I know, it's so easy with this bag!! Ingenius idea - I wonder if I can find something similar in Europe! I could really use something like this for winter water supply to my girls turnout area! Yes, I live in Europe and I know shops that sell it! I can send you some links if you want.